To reserve free tickets for the event, go to hsu.edu/celebration. 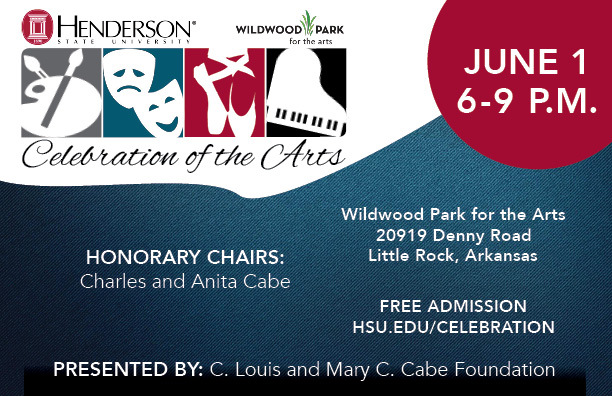 Henderson State University students and faculty will showcase their talents in visual arts, theatre, dance and music Thursday, June 1, at Wildwood Park for the Arts’ new collegiate arts initiative in west Little Rock. Henderson’s Celebration of the Arts is open to the public at no charge and will begin at 6 p.m. with a reception inside The Galleries at Wildwood. Guests can enjoy hors d’oeuvres and a cash bar while viewing a variety of visual art created by Henderson’s talented students and faculty. Following the reception, guests will be treated to dance and drama performances in the 625-seat Lucy Lockett Cabe Festival Theatre, and live music will conclude the event in Wildwood’s covered outdoor Pavilion. The C. Louis and Mary C. Cabe Foundation is the presenting sponsor of Henderson’s Celebration of the Arts. Charles and Anita Cabe of Gurdon are honorary chairs for the event. Wildwood Park for the Arts, a 105-acre park in west Little Rock, is home to unique botanical gardens, woodland trails, and the Lucy Lockett Cabe Festival Theatre complex, which is named for Charles Cabe’s aunt. Wildwood’s collegiate initiative will provide the state’s colleges and universities a venue to showcase their fine arts in central Arkansas, while providing students of The Wildwood Academy of Music & the Arts (WAMA) opportunities to explore the artistic resources available in Arkansas’s institutions of higher learning.